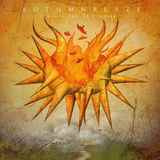 Somewhere in the depth of my collection I have an album by the German band Autumnblaze called Bleak. And bleak my first impression of it was. I recall listening to it a couple of times, finding no redeeming values and trying to unload it on eBay. There were no takers. Before embarking on the review of Every Sun Is Fragile I re-listened to Bleak and remained just as unimpressed. So naturally I was hoping Every Sun Is Fragile would be more uplifting. The results, however, still remain mixed in my modest point of view. First, Autumnblaze claim to have invented the term "trip rock". Not sure about how accurate that statement is since The Gathering were successfully tripping along since mid to late 90s, before Bleak showed up. However, if you call tripping a bunch of melancholic drifting mixed sporadically with tougher deathlier parts, then certainly Autumnblaze are a bunch of trippers. They still continue pretty much with the same tendency to mix soft and harsh in the ways only they see fit on Every Sun Is Fragile. There are atmospheric euphoric, Alcest-like inserts (Opening) which feel promising but don't develop further. Mostly, there is a whole bunch of meandering, not really metal in many ways (Mein Engel, Der Aus Augen Fließt), but periodically bringing up some background growling (title track), or bass-led syncopation(Invisible Fields). Riffier, more gothic death Im Spiegel is still doused in melancholy, but frankly the best moments of Every Sun Is Fragile come where Autumnblaze go for guitar sound which is a dead ringer for Katatonia on The Last Fair Deal Gone Down. If you loved what Katatonia did there, then tunes like New Ghosts in Town, the opening of the title track and Cold Soul, would strike the cord. Frankly, just sticking with that approach would make Autumnblaze rocking more on the whole. Otherwise, adding a lot of parts into New Ghosts in Town makes that too convoluted of the story. The cool subtle harmonies are great, but then a lukewarm melodeath part appears out of nowhere with its lazy blasting smearing the ending. Worse, adding an anxious youth screaming to the atmospherics of A Place for Paper Diamonds makes that song suspiciously commercial and an attempt to put something modern and radio friendly. I would say that Every Sun Is Fragile made for a better listen for me personally than Bleak. It is definitely more engaging, but if your best parts are sticking to someone else's successful formula (Katatonia), then there is still a lot to be desired. In my book anyway.